For local children of primary school age, Borough Green Baptist Church required a new flyer to recruit for their kids clubs. Designed a colourful, clear and engaging A5 flyer to be printed and sent out to primary schools in the area. 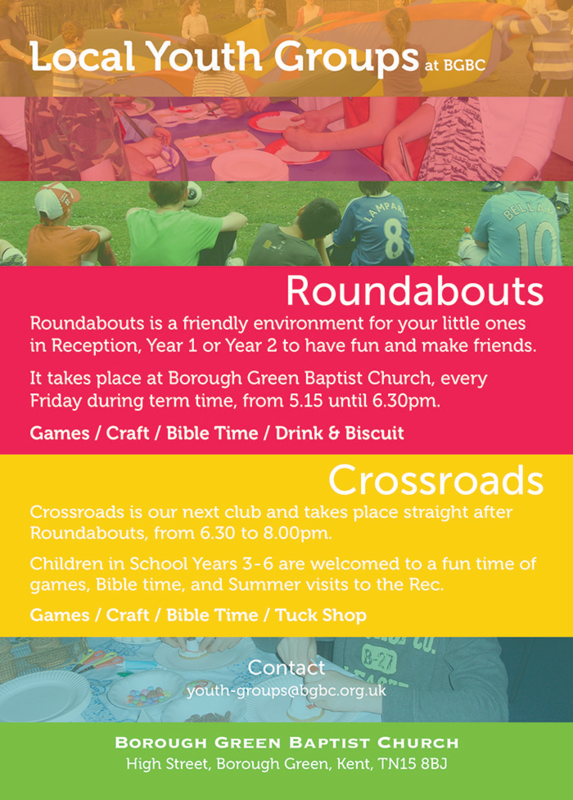 I made use of photography from previous events held by the church, as well as writing content in a friendly, informal style to introduce kids and parents to Roundabouts and Crossroads, two Friday night clubs local children. Borough Green Baptist Church, Kent. Adobe Photoshop CC, utilising print layout dimensions from Solopress. I'm a creative Christian guy, using my wide range of marketing skills to help you communicate effectively and with style. I offer rebranding and website design services, as well as graphic design and digital communications consulting.